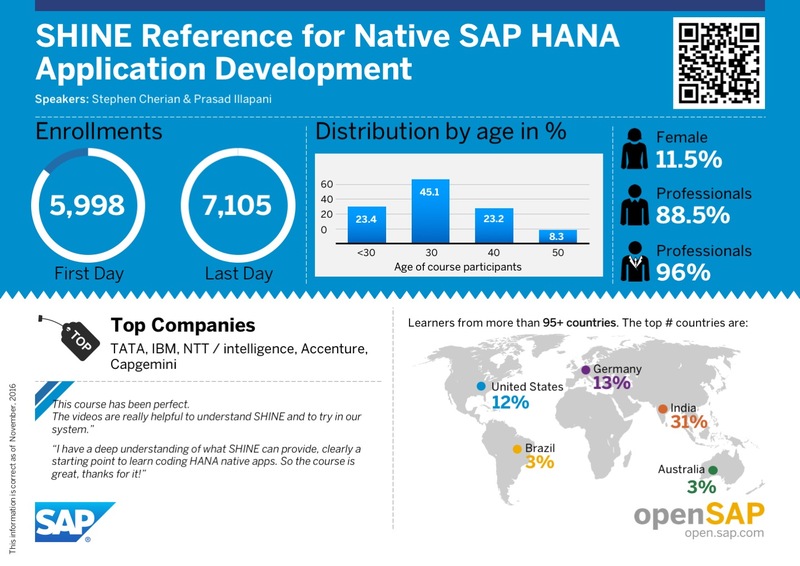 At the beginning of 2016 we started our SAP HANA Core Knowledge series on openSAP to give you insights of special features on the SAP HANA platform. SHINE Reference for Native SAP HANA Application Development was the last course in this series for 2016. Our instructors, Stephen Cherian and Prasad Illapani, gave you a general overview, showed demos, and provided details of the major capabilities of SHINE (SAP HANA Interactive Education). SHINE for SAP HANA XS Advanced Model was also included in the content of this course. The course was open on the openSAP platform from 5 October – 3 November 2016. Please stay tuned to openSAP to get the latest information on the SAP HANA Core Knowledge series for 2017.